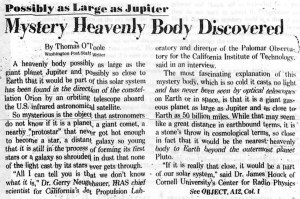 The date was December 30, 1983 and Washington Post staff writer, Thomas O’Toole, published an article titled Mystery Heavenly Body Discovered; Possibly as Large as Jupiter. (You can read the article here ). The article details the discovery of a large body within our solar system in the direction of the Orion nebula. Infrared Astronomical Satellite (IRAS) made the discovery during its infrared sweeps of our solar system. The object was believed to be within about 50 billion miles of the Sun. Similar bodies have been detected or hypothesized by very credible scientists over the years. The body has gone by many names – Planet X, Hercolubus, Nemesis, and Tyche. Some have even linked it to the Sumerian historical account of the Planet Nibiru. In the 1983 article, two distinguished scientists offered their thoughts on the discovery.